Black History Month: Still Looking for millions to be killed? 63-0628M O.LORD.JUST.ONCE.MORE I wish I could talk to Martin Luther King. That man, being a Christian, don’t know he is leading his people right into a death trap, where there is going to be millions of them killed. See? He is wrong. 63-0721 HE.CARES.DO.YOU.CARE_ JEFFERSONVILLE.IN V-12 N-4 SUNDAY_ « 16 † It’s inspired of the wrong thing, you see, see, they, them people. And that’s the reason I say that, not that there is any–any prophecy concerning it. I have nothing on it from the Lord. And be you sure now, if I say anything from the Lord like that, to tell you, it’s always… I’m speaking now. But when He speaks, I say “It’s not me, it’s THUS SAITH THE LORD.” And I can’t say it until He tells me. I could be altogether wrong in my thought about Martin Luther King. I don’t know, I can’t say. That’s just my opinion. 63-0707M THE.INDICTMENT_ My, goodness! If the people ain’t got heart enough to associate with a man because of his color, they’re condemned and dead, anyhow. The nation gives them right. Don’t fight against it. Don’t. What if somebody said all the Irish or somebody, all the German, or somebody else, had to disassociate? That would never bother Christians. They would move right on. And that man’s a Christian. 65-0815 AND.KNOWETH.IT.NOT_ JEFFERSONVILLE.IN V-2 N-10 SUNDAY_ Look at nineteen people being killed, racial. Didn’t I tell you, here not long ago, that that Martin Luther King would lead his people to a massacre? How many remembers that? [Congregation says, “Amen.”–Ed.] It isn’t them colored people; it’s them leaders stirring them up. It isn’t integration, segregations, and whatever they want to call it; it’s the devil. That’s right. Not only to the white, colored; this is all of them. It’s the devil. Nathan Bryant I wonder how many have been killed due to race riots, racial animosity, etc since then? He never said it would be a million people at one time. Just because something isn’t fulfilled the way we assume it will be doesn’t mean it isn’t / won’t be fulfilled. Many probably thought Elijah’s prophecy of Ahab was false when dogs didn’t come lick his blood on Mt. Ramoth-Gilead, but one little armor-bearer saw the vision fulfilled when he took the king’s chariot back to wash the blood out in the pool of Samaria. Trevor Emond It can also be that it wasn’t a prophecy as he told us. This was his opinion and he told us such. His point was the inspiration behind it was dangerous and that if it continued, it very well could start a bloody revolution. Bro Humes’ mother was very tore up about what Bro Branham had said about it. She saw him in a grocery store one time and asked him about it, and Bro Branham replied that was no different than any minister offering his opinion on it. Bro Humes told me of this himself. When I came across the quote from He Cares Do You Care, I felt there was truth to that. He then goes on to relate the 19 deaths in Birmingham as part of it. Trevor Emond So we find a balance is good. People shouldn’t say, “oh, guess he missed that one”, yet we understand what he was talking about. Nathan Bryant It is probably impossible to tally it world-wide since then, and it wasn’t a ‘prophecy’, but I don’t think we should just throw it aside and say ‘oh well’ because it didn’t have THUS SAITH THE LORD behind it. It probably has been or is being fulfilled gradually. God has performed many things that his prophets have spoke through the ages that weren’t THUS SAITH. Trevor Emond Going to bitterly disagree and stop fellowshipping with you now. Nathan Bryant Fine! Be that way! I’ll just draw the circle bigger and draw you back in! After all had been made ready for the event! That’s what’s taking place right now. All has been made ready for the event, a Church being pulled out for His Name’s sake, taking His Bride out from amongst the world, these denominations and all the world, and the filth and things of the world. That’s the way It’s always come. That’s the way It’s to come this time. That’s the way It always come. Not through a denomination! Never did God use a denomination, never! The reformer goes forth, he gets the Word of the Lord. And then when he dies, they build a denomination out of it. That’s what the Pentecostals and all did. When the new issues, everything, that’s just the way. That’s the way the thing come out. A new word added, then they build a church out of it, made a denomination, separated themself. It had to be that way. Now, you can’t beat–you can’t beat nature. Nature falls in the same routine, all the time: stalk, leaf, tassel, so forth, shuck, then the wheat. Now notice. All was ready. Everything had been kindled and made ready. And everybody was standing out. I had my head sticking up; my arm around my wife. We was looking. And children standing there, all of us looking up, like that. My! It was something, ’cause we was expecting it. It was promised to us. Amen! The Word promises This. “It shall come to pass, before the great and terrible day of the Lord shall come, behold, I will send unto you Elijah the prophet. He shall turn the hearts of the children back to the fathers.”…?… “It shall come to pass in the last days, I’ll pour out My Spirit from on High.” “The former and latter rain shall come together in the last day.” All these promises, through the Scriptures, been given. We’re looking upward. Watch at the true Bride across the nation this hour, looking up. Church, He is coming, one of these days. Just as sure as He come the first time, He is coming again. Get everything ready. Separate yourself from shuck. Lay before the Son. Keep looking up. Be under expectation. Then this man, standing right there by the side of me, said, “Let the fire fall.” Here it come, pouring down across that mountain, a glacier of fire and blazes a licking, a sight to behold. A precious friend of ours (Bro. Jack Duff – Pastor of ‘Spirit & Truth Tabernacle in West Palm Beach, FL) visited us recently for some special meetings. On Friday night (11/11/11) he used this quote for the basis of a sermon he titled ‘Let The Fire Fall‘. Yesterday, Bro. Trevor sent Bro. Jack & myself the link to a video he had found of a park ranger telling a very similar story about the ‘Fire Fall‘. The video also included the details of how the ‘Fire Fall‘ started in 1872, and why they stopped performing the event in 1968 (due to the overwhelming amount of visitors & traffic caused by the event, and because it was not a ‘natural event’). My first thought was, ‘It would be fun to re-create this event‘. Spiritually speaking however; you cannot try to re-kindle, or re-create the fire from another generation. We mustn’t try to make our experience match someone else’s, but our experience MUST match the Word of God. As nice as it would be to have a video of this event from back in the 1960’s; ‘you can’t get warm by a painted fire‘. While the historical record would be nice to have; by Itself the Letter killeth, but mixed with the Spirit It is quickened to give Life. The tree bark the park workers used was dead in & of itself, but when they mixed it with fire it provided life-sustaining warmth. So must we become dead to ourselves & dead to the things of the world so that the Holy Ghost & Fire can be kindled in our lives until it is no longer us, but Christ that lives in us! I also like that this was not just a monthly event (taking the communion), or an annual event (waiting for a revival), but preparations were made all day long, every single day so that the fire could fall daily! May we live so close that a fresh anointing of Fire can fall on us daily! Q. Just when WERE they created? Answers In Genesis makes no apology for not putting words in the Bible. If birds and fish were created on the 5th day and land animals on the 6th day, well depending on the type of dinosaur, those would be your days. No “other creation” or anything like that. The logic being, the Bible doesn’t tell us what day the robin or albatross was created on, why should it tell us when a pterodactyl was created? The Bible doesn’t specifically tell us that the Rhino was created on Day 6, why then should it list the T-rex? Why should we think differently just because they aren’t around anymore? The only reason we do, is because of our evolutionary teaching culture. Here the other day they found a–a some kind of a dinosaur tooth, up here around of… I guess you all heard about it; up here at the Niagara Falls. Said, “It weighed six pound.” I thought they was going to say it come out of a man, but I–I think they finally defined it as some kind of a prehistoric animal. Those animals probably lived one time on the earth. Where are they now? Do you know, God Almighty could command dinosaurs to come upon this earth, in the next hour they’d be forty miles deep? You know, God could destroy this world with fleas? He could call for fleas. Where do they go when they die? What happens to the housefly? What happens to the grasshopper? Wintertime comes, and goes forty below zero; and, go out the next spring, grasshoppers all over everywhere. Where did they come from? He’s the Creator that speaks it into existence! He is God! Nature obeys His Word. And I said, “Lord Jesus, You said, ‘Take no thought what you shall say when you come before man, because it’ll be given to you in that hour.’ Lord, what shall I say?” He said, “Tell him, ‘It’s here. '” Just the same as I see the visions on the platform. I said, “It’s here,” not knowing where. God was so satisfied! “And He rested from all His works, at the seventh day,” and hallowed this seventh-day sabbath for Him. Because, God looked it all over, after He had been six thousand years in molding it and fixing it out, making it come into existence; and put the mountains up, and make the volcanics push the mountains up, and the things that taken place in the eruptions; dried it off, and fixed it the way He had it. And it was a beautiful place. There was nothing like it, the great paradises of God! And the great dinosaurs, and whatever more, crawling through it, and of the great animals; no harm in them. They were just as gentle as a little kitten. They had nothing at all; no–no sickness, no sorrow; not one disease germ on the earth. Oh, what a place! The great birds swinging from tree to tree, and Adam could call them by name, and they would fly up on his shoulders and–and coo to him. And, oh, what a wonderful place God had! In the last quote on Satan’s Eden, I think it’s easy to see that Bro Branham believed that dinosaurs were in the original creation, co-existing with Man in the Garden of Eden. If that is true, then it would also follow that dinosaurs could have been on the ark. If we believe that many of today’s dinosaur fossils were indeed created by the flood, they had to be on the Earth just prior to the flood. If they were on the Earth just prior to the flood, they would have fallen under “And of every living thing of all flesh, two of every sort shalt thou bring into the ark, to keep them alive with thee; they shall be male and female” (Genesis 6:19). As incredible as it may seem to some, I see no reason they wouldn’t have been on the ark. In conclusion, what I have found, is that I don’t find a problem in the message with how the Answers In Genesis Creation Museum presents how the dinosaurs came to be, and that they were on the ark. As odd as it might seem, I’ve seen them lay–people laying dead: Finland, three or four different places I’ve seen in my life–and God would let my spirit so leave me till it’d go out into the land, and catch that spirit, and bring it right back again to that person. It’s true. God in heaven knows it’s true. Over the past few years I have been trying to keep track of how many times Brother Branham says on tape that people were raised from the dead in his ministry. I’ve asked quite a few brothers who have been in The Message for many, many years how many cases they know of, and the answer has almost always been the same: “Seven times”. In my studies I have found at least ten separate cases that he refers to on tape. There could definitely be more, and I will update that number if more solid cases are found on tape. Some people count the sister from Kennett, Missouri he prayed for in the ambulance at his first meetings in Jonesboro, Arkansas. (It was when he was leaving the ambulance to go back inside the auditorium from praying for this woman that the little blind colored girl found him and told him if he could get her to ‘the healer’ she wouldn’t need help finding her daddy). Her husband told Bro. Branham she was dead, but Bro. Branham says several times that he didn’t believe she was. He felt that she was only unconscious, or in a coma so I do not include that one in this list. This lady out here from Kennett, Missouri. I know a lot of them thought she was dead; she might’ve been. The night the little blind colored girl was healed back there behind the place. You remember the…?… when I was here the last time. Now, she might’ve been dead; I don’t know. I think she was in a coma. She come on down testified, plumb to California about her healing: cancer. Maybe setting here tonight, for all I know. And so, but I don’t know whether she was dead or not; I couldn’t say. Well now, truly, I don’t think the woman was dead. But anyhow, in this case here, I think the woman was in a coma. And I’ve seen so much done, I tell you, friends, I–I just know God can do everything. I’ve seen leprosy in it’s last stage, healed. I’ve seen people that was… I’ve got doctor’s statements of people have been laying dead, examined by the doctors, dead, come back to life again, by faith, just believing it. See? And a little mother stand over her baby, and see that baby return back to life after being–died that morning at nine o’clock and this was pretty near ten thirty that night, just recently, down in Mexico. I said, “Don’t call that; let the doctor’s sign that.” See? So when we make a statement, it has to be backed up. And this morning when I was turning, see, and I’ve seen, many times, the Lord Jesus bring back the dead. The little baby in Mexico died at nine o’clock that morning, and this was between ten and eleven that night it come back to life. And–and that’s a bona fide testimony with doctor’s witness of it, see, that the baby died in his office at nine o’clock that morning. I think it was pneumonia. And the baby is living today, so far as I know. And that was before, oh, my, thirty, forty thousand people. We were thinking about whether these visions I would remember them very long. Sometime ago I had one, about four years ago to be exact, of a little boy being dead on the side of the road, struck by a car and killed. And he was to be raised from the dead. Well, I told everybody about it, prophesied throughout the United States and Canada. Thousands of Bibles had it written on their flyleaf, that this would take place. One day while we were having campaigns in the Scandinavian country, we were coming down through Finland, from Kuopio. And there was a group of people gathered on the side of the road. They were hovered over some sort of a form. We got out to look. There it was, the little boy, everything, the scene, just the way it was shown to me. “Yes,” he said. I knelt down and asked our Lord Jesus to confirm His Word that He’d showed me, and had told me would come to pass. The little boy was brought to life again by our Lord Jesus. He’s alive and healthy today. Went down, put my hands upon him, he was just as cold as that desk is. He was gone. Mrs. Way said, “Oh, Brother Branham, he is gone! He is gone.” Screaming at the top of her voice. I looked away. I saw the resurrection and Life. I prayed the prayer that Jesus told me to, and Brother Way raised up. Here he sits right here tonight, come up from the dead, sitting right here tonight. About two months ago, in my church, one Sunday morning, there was something, Satan doing something to attract the attention of the people. There was an Englishman there, by the name of Way. He lives at my… You want his address, or we can have you to write. He sends tapes of the meeting from overseas. And the man resented what I said, heartily. And I looked down, I seen that horrible spirit upon him. I had him on private interview, told him. I said, “Mr. Way, you have heart trouble.” He even resented that. I said, “Why did you come to me for, then?” So about a month after that, he went to the doctor, and the doctor said he had a very bad heart. So he come to the meeting that morning, and something was said; real hot-headed Englishman, you know, he resented that. His wife, a wonderful Norwegian woman, a nurse, and was sitting there with him. And I said something, and he resented it right quick, you know. And when he did… He was standing to the feet, and they were singing. And when He did, his head went back, his eyes just flipped right straight back, his face turned real dark red, like that desk there. He fell dead, to the floor. He said, “Brother Branham,” and there he was alive again, standing among us. She was dead–been lay–laying dead in the prayer line, covered up. And she… That was three years ago or more; she’s just as well and normal as she can be. Here was Mrs. Hattie Waldrop from Phoenix, Arizona, died in the prayer line. She told the intern and them, when they was bringing her through, said, “Take me through anyhow.” And when she got up there, been dead… There’s her address, name, number, everything. She’s living today: had cancer of the heart, colon, and liver. The doctor give her up, said, “There’s not a chance.” And they brought her anyhow. She died over a city block away from the place. Now, in Phoenix, that was during the time that Mrs. Waldroff here had died in a prayer line, with cancer in her heart, and was healed. She usually comes to the meetings. She is probably here now. And then… Mrs. Hattie Waldroff. Then we find out that her doctor had the testimony of it, give the–the photographs, or not the… What you call it, x-rays? X-rays of it, where the–the woman was had the cancer. And she is living today. And that was sixteen years ago. Now I’m quite sure that mister… Yes, there is Mrs. Waldroff, right there now. That’s right. [Someone says, “That’s been seventeen years, this March.”–Ed.] That’s seventeen years, this March. There is a lady that was dead, and come to life again, with cancer in her heart. Because, it was THUS SAITH THE LORD. How many ever remembers when Elijah Perry was raised from the dead that morning, some of you over here? You seen it in the paper here, many times. I seen Sister Wilson and them raising their hands. I was standing there when that man died. He lives right out here now, comes to church once in a while, testifies of it. He had been dead several hours. He died with hemorrhages of the lungs, and he was so bloody all over. And I walked away; I was just a young preacher, those days. And Sister Jackson used to be a member of the church here. And–and a Methodist preacher’s wife, I forget what that man’s name was now; Shafiner, Brother Shafiner and Sister Shafiner, they were some relation to the Wiseheart’s. And they… And she was standing there at the bedside. And I started to move away. And he was just as bloody as he could be, where he died. And his eyes was turned back, and his throat had bulged out. And they pulled a sheet over his head. And his wife was out there. They were crying, and trying to get addresses to call the loved ones. And I started to walk away from the bed, and I felt Somebody lay Their hand on me. I thought it was Sister Shafiner. And when I turned, there was nobody around me. And then I started… It left me when I turned around. And Brother Elij’ was laying there dead. We’d been very good buddies, fished on the river, you know how we did so much together. And he got hurt out here, a railroad, riding spider. Well, it mashed his lungs in. He was bleeding; he bled and took TB from it, and died. I started to move away this way, and then I felt that Hand again. I turned back, It would get off of me. And before I knowed what I was doing, I was laying on top of that man, with my lips against his lips. I was as bloody as he was, laying there on that man, crying out to God. And I felt something come up around the side of my ear; it was his hand. And you’ve heard him stand right here and testify of it. See? How he–that he come back to life. And that’s been about twenty-five years ago, or maybe thirty, living today right out here on the curve. And he come here not long ago, was testifying of it in the church. We were having a meeting, and I was just getting ready to make the altar call. And I noticed a woman acted real funny, and her daughter run over there, begin to rub her face. I thought, “Well, she is subject to fainting.” And all at once, her feet went right out straight, and her hands went back like this. Dr. Barton run over to where she was, took her pulse. She had none. He looked up at me, shook his head. Well, I tried to keep the people’s mind… They was setting out, a great crowd. Keep it off of it, like that, just going ahead, talking. And so he said, “Go get little Branham.” That was Billy. And Billy seen that dead woman. He had nothing to do with that. See? He didn’t want that. Well, just as I started to speak again… Now, Dr. Barton, as you know him, you might ask him. And while I was speaking like that, I don’t know how it ever happened, but turned over to her and called her name. “Mary, looky here.” And when she did, she come to herself, come to. I like to brag on Jesus Christ and His power. But at this time I think we should never try to brag on Him in any way to something He–He–He didn’t do. But I have seen Jesus Christ raise up the dead, many times, infallible, doctors’ testing to prove. When anyone, their heart stops… You can close your eyes, but when you are shocked to death, when your heart stops, really your eyeballs turn back, and the white part of your eye pushes out. And I noticed it as she sank down. And quickly they called for the medical doctor, and he run to her to take her pulse, and shook his head, put his hands upon her, his ear to her heart. And she was gone. She sank in the floor, and her daughter screaming, which interrupted the meeting. I continued on, ’cause I didn’t have no word of the Lord for the woman. And I continued on. They said something about getting Brother Branham. And they said, “We don’t want to call him in the prayer line, ’cause he’s under discernment.” And they said, “Get little Branham,” that was Billy. And Billy, being it was a woman dead, he didn’t want to. You know, people get suspicion of somebody being dead. That, that’s–that’s just a hull. There is nothing there. That, people think strange. That, the person isn’t there, themselves; they’ve moved on. And so he was afraid to–to go around the woman, because she was dead. She said, “Yes, Brother Branham.” She was all right. And–and she had never seen us before. And it was the first in meeting. There is a little minister here somewhere. I seen him here, a while ago. Martin was his name. I forget… He is one of the sponsors. Right here. About midnight, close to it, someone woke me up in my room. A little fellow crying, a little minister, his baby had just passed away. The tears running down his face. He’s plumb up in somewhere in… What’s the name of that town they live in? [Someone says, “Missouri.” –Ed.] Missouri. Up at where? [“Wardell, Missouri.”] Wardell, Missouri. I know the boy. I know his brother here, too. They’re friends of mine. This brother walked in there with tears running down his cheeks, said, “Brother Branham, I just called… My wife just called me. My little baby just quit breathing.” He laid his hands upon me, said, “Brother Branham, I believe the Word of the Lord is with you.” Oh, how could God… Just like, “Even now, Lord! If You had been here, my brother would not have died.” See, he wasn’t confessing to me. He was confessing the Word of the Lord, you see, that I was preaching the Truth. He said, “I believe the Word of the Lord is with you. Just ask Him; my baby will live.” In ten minutes from then, his baby was breathing normal, is well now. [Brother Earl Martin says, “Brother Branham, would you lay hands on me, ordain me to work as a pastor?”–Ed.] John Martin… [“Earl.”] Earl. How many knows Earl Martin? How many believes him to be a servant of Christ? He comes to us from a… I believe the, originally, from a Pentecostal group, and now I think he pastors and does a independent work. I’ve knowed Earl to be a real servant of Christ. I’ll never forget one act, many has been, but one act with Earl. I remember one night they called him when I was in Dallas, Texas; or I–I believe, no, it was… [A sister says, “Beaumont.”–Ed.] Beaumont, Texas, is right, sister. And they–they… His baby was laying, dying, and they thought it was already dead. It wasn’t breathing no more. And Earl made his way around to my room, as a daddy, bending shoulders, stooped down before me, as I was in bed. Rolled out; he put his arms around me and said, “Brother, I believe you are God’s prophet. I’ve always believed that. And if you’ll just say the word, though my baby is dead, yet shall it live.” And his baby come back to life, is living. One of the outstanding events of the last meeting, was happened in Shawano, Wisconsin. It was at the high school auditorium, the new high school auditorium, when we were just about ready to pray for the sick. I’d just made the altar call, and many had raised their hands to accept Christ as their personal Saviour. And then it was that I noticed something taken place, which was right out in the audience, a little piece from me. And it was a man of about seventy or seventy-five years old. He fell dead and died with a heart attack. The froth poured from his mouth, and the water broke over his clothes. And–and his wife real frantically rubbed his face. And–and I knew that was the trick of the enemy. He does those things just to get the people upset (See? ), and then when he does that, it goes to a frantic. It’s happened many times in the meeting. Just recently in New England, it happened like that again, just before that call. And so to keep the people from being excited, I… In those kind of times you must keep your wits to see what the Holy Spirit will say. Because we’re taught in the Scriptures that all things work together for good to them that love God. And there was many of God’s children, lovers of Him. And I kept looking at the man, and seeing he’d done got frothy in the mouth. And–and as anyone knows, when death strikes a person, usually water breaks. You see? And they–and his wife so rubbing his face, and she was just going like that. Now, to keep the people from noticing her, I said, “Your husband, would you want someone to get him a drink of water?” and get her attention. And she said, “Brother Branham, I just leave it all up to you.” And she was a–a Lutheran by denomination. And when I started to pray, I–I heard myself praying, which said to this death, “Turn him loose.” And no more than it was said that, till the man came back to life again, and raised to his feet. And the whole city went like frantically about it, what the Lord had did. And I looked. I said, “Just everyone keep seated, be quiet.” See? I waited for the Lord to give me a word. And–and I… Satan… I was just fixing to make the altar call, and that’s just when he wants to show hisself. So did you ever notice when you start to make a altar call, even little babies will start screaming, and things like that? That’s Satan. You who are spiritual understand. So the Lord gave me his name, and I called him, and he come to life just like that. Talking to my little friend, Ernie Fandler. I guess some of you out on the hookups will remember Ernie, how he was converted, how he was led to the Lord. He doesn’t talk good English, or I’d like to have him come say a word. And he gets his we’s and W’s all mixed up. He was asking me if I remember the time at the Shawano where he lives. There was a man died right in the meeting, dropped over in his seat dead, Lutheran. And we had everybody keep quiet. Spoke the Word of the Lord over him, he come back to life. He come that other way. They had never got over that, wants us come back again. And I picked up the little cold form. It was already stiffened. And these people standing around… I held it in my arms, started praying to our precious Lord. I felt the baby was getting warm. Just kept holding it, just a few minutes, and it started kicking, crying. I handed it over to its mother. The longest one I knowed of, was from nine o’clock one morning, till eleven that night, about. See? No, I beg your pardon. A little baby over there, that the mother had carried it all night in her arms. It died one afternoon, she carried it all night in her arms, come to the meeting down there in California. And I was taking out that afternoon. Had died the afternoon before that, and she drove all night, got there, couldn’t get around the place. And she layed a cold little form in my arms, of a dead baby that had died the day before that. And standing, holding that little baby, and just offered prayer. His little body got warm. He turned over and looked, and I handed it back to its mother. True. That’s right. But, now, we’re seeing strange things in this day. Now I’ve remember the last time I was here was in a tent meeting. I remember of speaking of it last night, of a little couple that brought their dead baby in. It–it’s up somewhere up here, they drove all day and night. The little mother setting, sad, holding that little baby in her arms. Now, she may be setting right here now, for all I know. And she… the little husband, couple of more couples with them, and they was… And she said… asked me if I’d come over (the man did) to the car. I took the little baby out and was just holding it; a little, dead, stiff, cold form; and I started to pray. And when I prayed, that body begin to feel like it was getting warm. So I just… I kept on praying. He started kicking and moving, going along, so I… started crying. I handed it back to the mother, she went on back home with it. So, they might not even been Christians, for all I know. See? That was wonderful. Said, “I will see if I can get there in time. It’s on its road.” Well, I was sitting there. I wondered, what did the mayor mean? And just that night, there’d been a woman had died over there that day, a friend of his. Prayed for her, she’d come to life. The papers given big headlines about it. And about four hours from then, Sidney Smith, the mayor of Durban, Sidney Smith, mayor of Durban, South Africa, called me on the phone. Which, had been a woman that had died, the night before that, and been called on, to pray. And she was at the meeting, alive. And so, then, that was Sidney Smith’s relation, and he was all thrilled. I trust that this study on The Message has been a blessing to you. If you come across any other instances (on tape) where Brother Branham says others were raised from the dead in his ministry please e-mail the quote to twomessageministers@gmail.com so we can update our count & add the quote to this article. 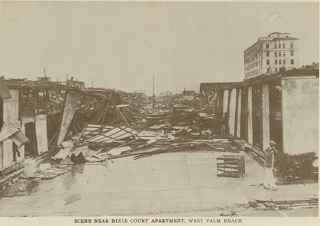 The ‘Great Miami Hurricane’ (a category four hurricane with winds estimated over 125 mph) devastated Miami as well as causing major damage to other parts of Florida, Alabama, and the Bahamas. Total casualties from the ‘Great Miami Hurricane’ were estimated at 373. The hurricane of 1926 also reached Lake Okeechobee (in Okeechobee, Florida) breaking a portion of the dikes, causing many casualties. This would only be a small preview of what would happen two years later during the 1928 ‘Okeechobee Hurricane’ (also referred to as ‘The Storm of 28’). The S.S. Commack sees the hurricane 900 miles East of Guadeloupe. The hurricane escalates to category 3. The hurricane reaches southern Florida. Initial reports from the U.S. Weather Bureau were optimistic that the hurricane would pass the south Florida region. By September 19th the eye of the storm had crossed Palm Beach County near West Palm Beach, and directly over Lake Okeechobee, then turned northeast crossing northern Florida, and Eastern Georgia, as well as North & South Carolina. The ‘Okeechobee Hurricane’ was the second hurricane in recorded history to be listed as a category five hurricane in the Atlantic basin. 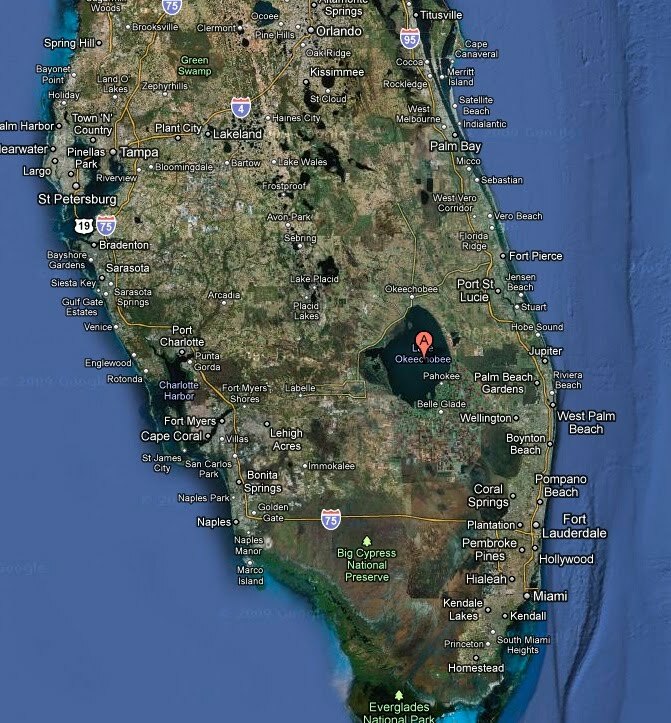 Covering 730 square miles Lake Okeechobee is nearly half the size of Rhode Island. Listed as the 7th largest freshwater lake in United States, it is the second largest entirely contained within the 48 states. The only means of flood control around Lake Okeechobee in 1928 was a six-foot mud dike. Winds were measured on the ground at approximately 140 mph when the worst part of the storm hit the lake on September 16th, 1928. These strong winds drove water over the six-foot embankment causing flood waters to cover an area of 100 square miles, as high as 20 feet deep in some places. Residents living in lower points along the coast of Lake Okeechobee had been warned to evacuate earlier that day, but because the hurricane did not arrive on schedule, many had returned to their homes (thinking that the hurricane had bypassed their area). Houses were torn from their foundations and smashed into pieces. 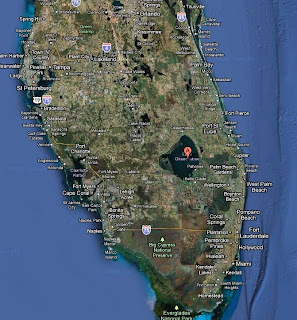 Many survivors and bodies were washed into the Everglades, and many of the bodies were never found. Flood waters remained for several weeks, making any attempts at repairing the damages extremely difficult. The number of bodies quickly outnumbered available burial services, so the majority were placed in mass graves. Nearly two thirds of the casualties were migrant farm workers, making attempts to identify the deceased or missing extremely difficult. The number of casualties in the Palm Beach area only climbed to twenty-six because the residents heeded the hurricane warnings. More than 1,711 homes were destroyed in West Palm Beach alone. Mortar from Jupiter Inlet Lighthouse was reported as being “squeezed like toothpaste” from between the bricks, causing the lighthouse swaying seventeen inches from it’s base. Brother Branham refers to this storm several times, using it as a type of how people fail to take heed when a message is given to warn of oncoming danger. We can clearly see the spiritual type, as so many fail to heed the warning of The Message. The Voice of the Messenger is still calling out today. May we heed the warning as the cry goes out for ‘whosoever will’ to come out of denominational creeds and dogmas, and away from the ungodly entertainments and pleasures of the world, to be hidden safely in the Rock of Ages until the storm passes by. * Hurricane Katrina caused approximately 81 billion dollars of property damage in 2005, but with modern development, and today’s prices it has been estimated that ‘The Great Miami Hurricane’ of 1926 would have caused 157 billion dollars worth of property damage. (The 1928 ‘Okeechobee Hurricane’ comes in at around 37 billion dollars worth of property damage in today’s prices). ** ‘The Storm Of 28’ is currently listed as number nine on the list of deadliest Atlantic with casualties estimated as high as 4,075. (Total casualties caused by Katrina are listed as 1,836). *** This quotation is taken from an inscription on a Florida Heritage Landmark in West Palm Beach, FL. 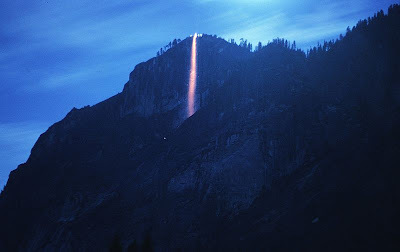 (An image of this landmark taken in 2009 by Brother Nathan Bryant is included in this post). On Saturday, October 10th, 1959 Brother Branham was hunting in Salem, Indiana with Brother Banks Wood, and Brother Fred Sothman when St. Mark 11:23 came on his mind, and he was wondering how that could be applied. “He didn’t say, ‘Pray,’ He said, ‘Say what you will.’ Just say it, and your words will materialize’”. There were no sick people there, he was just out in the woods hunting. What should he ask for? The Voice spoke again, “Aren’t you hunting? And you have no game?” Said, “Speak anything that you wish”. Brother Branham spoke the exact trees, limbs, and snag that he wanted three red (fox) squirrels to come out on (all about fifty yards away from where he was because his gun was sighted in at that distance). Every time he spoke the specific location a squirrel would appear until he had shot all three and picked them up. He watched for a while, and about ninety yards away a gray squirrel jumped off of a stump. He shot it, and then turned to his left and saw another gray squirrel coming around a beech tree. He shot that one, and a third one came from the same direction. He tried to shoot it three different times and missed all three shots in a row. He had only missed five shots so far that year out of a hundred and fourteen! I goes over to find the other squirrel; he wasn’t there. And I looked and I looked, and I searched under leaves, and raised up little pieces of chunk, and tore open an old log. And there wasn’t but one log laying within thirty yards. And I tore it all to pieces, looked under the sides, and held my hands in the leaves and felt. There was no squirrel there nowhere. “And I went on. Something just drove me on. And I went walking up through the woods, hunting. I kept thinking, “What if that squirrel isn’t in there.” He gave me his hunting knife so I could cut a–the hole bigger to reach in and get it. Brother George Wright from Depauw, Indiana (a little less than four miles from Milltown, Indiana where Brother Branham pastored the Milltown Baptist Church) made the Communion wine for the Tabernacle. Brother Roy Roberson had called Brother Branham wanting to go with him to Brother Wright’s house to pick up the Communion wine. They arrived at Brother Wright’s house early in the morning, and as Brother Banks Wood sat down beside Brother Branham at the table Sister Hattie Wright (Mosier) was sitting nearby listening quietly. Brother Branham told the stories of how the squirrels had been spoken into existence to her two sons, Brother Banks Wood, Brother Shelby Wright, little, crippled Sister Edith Wright, and Brother and Sister George Wright. Sister Hattie only made about two hundred dollars a year, and she had been telling Brother Branham how she tried to pledge fifty dollars to help build the new Tabernacle, but Brother Roberson would only let her give twenty. As Brother Branham finished telling the story; he compared it to there being a provided sacrifice for Abraham back in the wilderness, by saying, “Jehovah is still Jehovah-Jireh”. Sister Hattie (not realizing how important, or how immortalized her words would be, nor how many multiplied thousands of believers around the world would hear them repeated) said; “That’s nothing but the truth”. Five simple words. Simple childlike faith, but she said the right thing. God had already confirmed Brother Branham’s new ministry (of speaking the Word into existence) seven times by animals (six squirrels, and the place he would find one he had already shot). “I said, “By the will of God, by the power of God, I give you, in the Name of Jesus Christ your desire.” And her two boys shook under the power of God, and that whole building trembled. Banks fell into his plate. Shelby grabbed… And Hattie screamed till you could hear her for two blocks. And them two boys with tears rolling down their cheeks received exactly what they asked for right then. Had Brother Branham come with the great, swelling words of a theologian; would people like Sister Hattie Wright (or you and I) have been attracted to his ministry? I’m so thankful for a Prophet of God who yielded himself so much that God could speak through him, and bring us a Message in our own language, and in such a humble, simple way that simple people like ourselves could understand It. The majority of the details provided in this story, and direct quotes (marked with quotations and italic font) were taken primarily from the sermon ‘My New Ministry’ preached in Jeffersonville, IN (59-1115). Some additional details were provided from the sermons ‘Go Tell’ (61-0417M), and ‘Look Away To Jesus’ (63-1229E) which were both preached in Jeffersonville as well.